Have you had enough of your same old bathroom tiles? Do you find your bathroom setting getting dull? If yes, then your bathroom definitely needs some makeover. Apart from the other fittings, tiles need an attention to beautifully complement the look. Since bathroom is a place from where you start off a day, it should be maintained so as to offer rejuvenating experience for a refreshing start to cope up with the rest of the day. You may have seen stunning bathroom tiles at some good hotels or multiplexes and you would perhaps remember that embellishment, don’t you? Those glossy, colourful and glowing tiles really add up to elegance. So why not furnish your own bathroom full of perfect tiles? With so many varieties of tiles available in the market, purchasing the tiles has become a baffling phenomenon to some extent. But, considering some genuine aspects would certainly help you buy perfect tiles for bathroom. It is advisable to ponder over the size and shape of the tiles. If you’ve a small bathroom and still you go with the large tiles, the size and numbers of the tiles would highlight that you’re running out of space. Remember that, the larger the tiles, the fewer grout lines to be cleaned up. Though smaller tiles would make the bathroom seem large enough, it will also create some extra work of grout joints cleaning. When it comes to shape, rectangular or square tiles are preferable. If you like to enhance visual interest, you can alternatively use both of these. You can even go for elongated shaped tiles to extend the appearance. With a sequence of circular tiles, you can create beautiful bubble shaped design. If you like simplicity, 12 inch rectangular tiles would do the best. Today there is a wide array of tiles available. 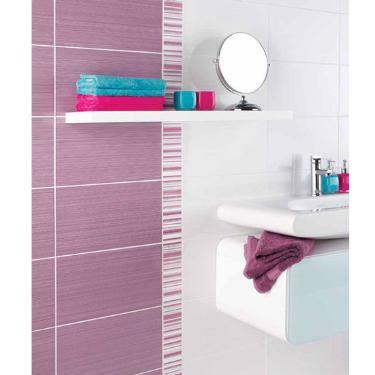 The Ceramic tiles are one of the most favoured and can be used alongside the shower or on the floor. These tiles are durable but not more than Porcelain tiles which are more expensive than ceramic tiles. The Quarry tiles are kept natural and any of these tiles barely look alike and thus, they have rustic quality. The Stone tiles work great both on the wall or the floor. In which granite tiles simply look better than marble and slate. For a sophisticated and sparkling look, modern glass tiles are a great option. These tiles come in a variety of colours and designs. Usually Glass tiles are costlier than the rest of the tiles but are more delicate as well. Colours play an essential role to beautify your bathroom décor. And when it comes to tiles, there are varieties of colours available to choose from. You can try a bright white with beige for a delicate look. For a graphic style, you can try on black and white. Green tiles with a white grout look stunning. If you have smaller bathroom, lighter colours like yellows, light blue, crème’s, pastel green etc. would make your bathroom seem larger. Whereas larger bathroom would go well with dark or bolder colours. Mosaics are better to highlight central design at particular area be it borders or backsplash portion. With so many designs and colours, mosaics reflect elegance and attractiveness in your bathroom setting. Lastly, colours being too personal stuffs have to be chosen well in synchronization with the rest of the furnishings. Don’t ever omit the safety feature. Always ask for the tiles having at least 60 COF (coefficient of friction) rating as it makes the tiles less slick to avoid any skidding. Choose the best tiles for your bathroom and experience classiness. Going for the right retailer would save you spend unnecessarily high. So research better and deal with good sources in order to make happy purchase. Diana Homes is an interior designer. She likes to share her thoughts on home designing. Her write-ups on varieties of accessories and furniture of modern bathroom, introduces great ideas to make the most of bathroom with good value for money.